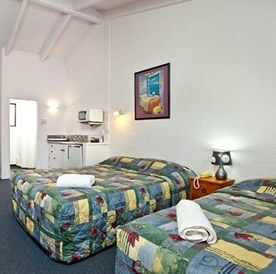 Located on the main motel strip about 2 km from the town centre, this is a clean and well-run, old-style motel with units in a courtyard. The owner was very friendly. The room I stayed in was basic, but very clean and had fridge, microwave, tv, heater, kettle, tea and coffee, iron, ironing board and crockery, etc. The bed was comfortable and I slept well. Free Wi-fi is by 1GB voucher, but the owner was generous with the vouchers. Job done well! When checking in we were made to feel like part of the family. The time was taken to show us all of the hidden treasures in town like Gibbo's fish and chip shop, the best walks to do in the area and even the best place on Ohope beach to find pippies. The room itself was fantastic. It was very large with all of the facilities we needed for our short stay. The bed was super comfy. We'd had some pretty rough luck with the wifi leading up to our stay here and were pleasantly surprised by the signal quality from our room. If we're ever in Whakatane again, this is where we'll be staying! As others have said, this is an older style motel but perfectly adequate. The bathroom had been renovated and had a good shower and decent sized vanity. The bed was very comfortable and nice quality bed linen. The room had a fridge, microwave and tea/coffee making. The owner was very friendly and helpful and pointed out a nearby river walk and the nearest shops/supermarket and restaurant options all of which were close by. The Cortez Motel is a small family-operated motel where the central courtyard has a number of picnic tables and a BBQ. The setting truly does encourage guests to mingle beside the outdoor swimming pool. Rooms are very clean but were somewhat warn at night as the single fan was largely ineffective given the minimal cross-ventilation. Sixteen of us pulled up here on motor bikes at the end of a hot day. After dropping our bags and stripping off our gear we all fell in the pool. Lovely. Its a 20 minute walk into town from here which wasn't a problem as it was a beautiful evening. Our room was spacious and clean and the bed was comfortable. We arrived with our 4 small children quite late at night after an arduous journey and Koru Dave and Karen were really welcoming, lovely, very friendly and helpful. Our room was spacious and comfortable and well equipped. The decor/theme is somewhat dated but the whole complex was clean and tidy. Great location, close to town centre but still easy to get to. Very reasonably priced, especially for peak season. The pool is not heated so was pretty cold, but that was not our main priority! Comfy beds. We would happily stay again. I booked a studio room, the most basic type available. Dave and his wife were both super friendly and welcoming. They gave us useful information about the town, e.g. where to find shopping areas, sights to see, etc. 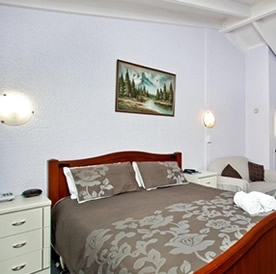 The room was adequate, if a little dated, with comfortable beds and quality bedding. I thought the service was outstanding - they washed our dishes while we were out, AND changed the towels even though we were only staying two nights in total. For $90 per night I was really pleased at what we got- great value - we even had Sky TV and free wifi. I recently stayed here with family members for 2 nights. From the street it doesn't look like much, especially compared to other motels on the same road, but I can say in all honesty that this is a great place to stay if your ever in town. My girlfriend and I stayed in one of the studio units; the bed was very comfortable, the bathroom was large, and the room itself was very spacious. The courtyard is also very nice, and there is a bbq that is free to use, and a medium sized swimming pool. 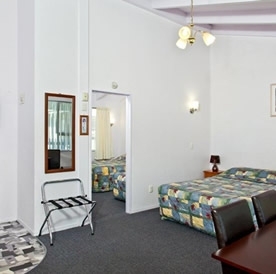 The family rooms are quite large and include a kitchenette, albeit all the rooms are a little outdated. Prices are very reasonable, and the owners are nice and pleasant. Being quite a small town, it's not difficult to get to town and the various sites of Whakatane. Lastly, the wifi is good but you only get 500mb which runs out almost instantly so I can't recommend staying here on business, but with family or a short visit this is a nice motel. Very friendly service. The owner waited for us with the keys well past 10:00pm. We also got an upgrade to a 2-bedroom place. Great water pressure and clean bathroom. Rooms are clean and kitchen is well equipped. You need a car to get to Whakatane's centre. I stayed at this motor inn for a single night after making a last-minute decision to stay in the Whakatane area ahead of a trip to White Island. The location is fine if you are driving a car, as the title suggests. The trip over from Rotorua is scenic. I was made to feel very welcome by the management when I arrived, including two colleagues who were covering on the first evening. I was allowed to make a local phone call from the office phone, which was incredibly helpful. The room that I took was very well kept and comfortable. Its bathroom was also very well maintained. Whilst there are some local shops near-by, there isn't much in the way of night life, so it's worth taking a bottle of wine and settling down outside in the BBQ area. I would certainly recommend this motor inn to other travellers.